Thank You, Ancient Egyptians... for big heads & pączki? Would you believe that Carnival (which is the celebration leading up to Ash Wednesday, which is the day before Lent begins, which is the 40-day period before the day before Easter... with Sundays not counted as part of the 40 days... AGH!!!) is yet another tradition that traces its origins to pagan festivals of ancient Egypt? Yep! I'm sure you can guess the story from there: Greeks and Romans took the customs to their respective empires, and later The Church magically transformed those customs into Christian practices. I imagine the Christian side of the event didn't stick for too many generations, and before long, it seems Carnival was full of pagan revelry again, albeit still timed with the Christian observance of Lent. As Christianity spread throughout The New World, the pagan-yet-timed-with-Lent celebration of Carnival spread with it. 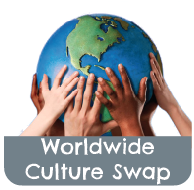 And so today, countries all over Europe, North and South America, the Caribbean, and Australasia have various pre-Lenten festivals which incorporate a local flair. These can range from simple, like a single Mardi Gras treat in a typical Midwestern household, to extravagant, like the famous weeks-long Carnevale of Venice. Sometimes the festival develops an entirely new meaning, as is the case in Trinidad and Tobago, where, since 1838, Carnival has become a celebration of the end of slavery. Because I love using holidays to learn about the world, I checked in with a few blogger friends to find out how pre-Lent looks where they live. Loved what I learned -and tasted!- along the way! Olga, a.k.a. 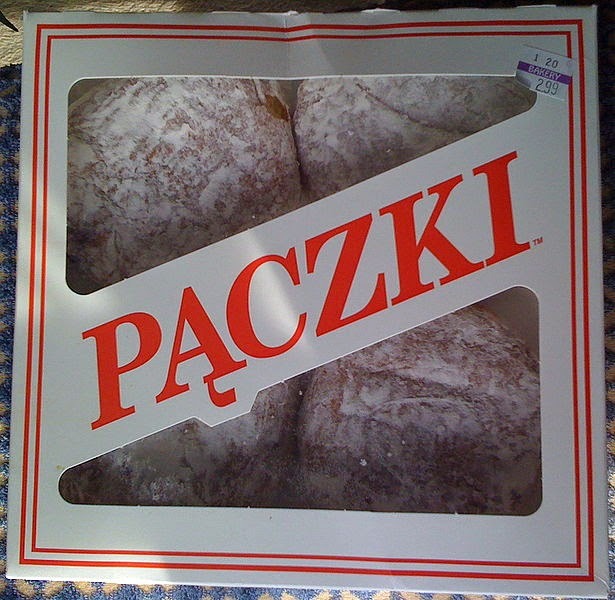 The European Mama shared that Poland celebrates Tłusty Czwartek, or Fat Thursday five days before Fat Tuesday (a.k.a. Mardi Gras). A highlight of Tłusty Czwartek? Indulging in pączki, a jelly- or creme-filled donut which has apparently been eaten in Poland since at least the Middle Ages. (If it, too, has ancient Egyptian origins, I haven't discovered them yet.) Pączki is now a much-anticipated seasonal treat in Polish communities around the world! And yes, I had my first one, a creme-filled version, this year. Mmmm! Giuliana of Washington, Dead Chef, actually grew up amidst the famous Venetian Carnevale. Guiliana reports that festivities begin weeks before Lent. Venice's Carnevale celebration became "official" more than 700 years ago, but it is thought to have been going on for a few hundred years before that! Today, Venice's Carnevale retains many early elements, such as costumes and masks, and copious numbers of deep fried dough treats. Check out Giuliana's post here to read more, including a recipe for her delicious-looking Frittelle di Carnevale! Stefania at Scrambled Nest has a great character guide to those famous masks of Italy's Carnevale (here). The masks originated with an improvised style of theater popular in Italy from the 14th through 18th centuries, Commedia dell’arte, and remain a beloved part of Carnevale, more than 300 years later. 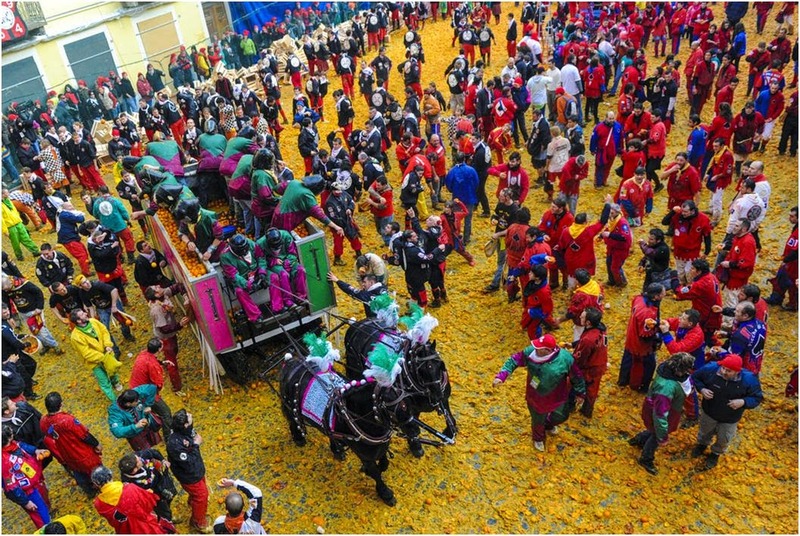 Stefania also shares a quick guide to various other Carnavali around Italy, including the exciting and colorful Battaglia delle Arance (Battle of the Oranges) in Ivrea, Italy. 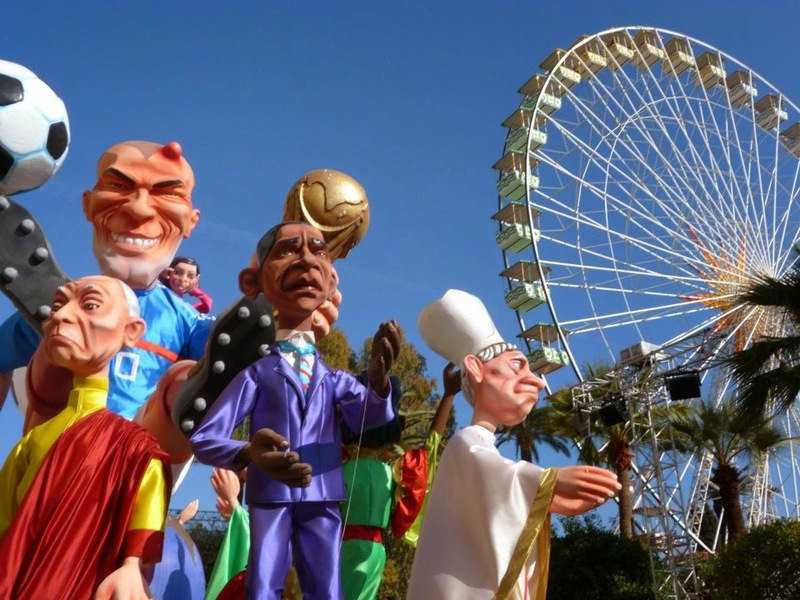 Claiming to be older than Italy's Carnevali, although shorter in annual duration, the Carnaval of Nice, France is also a worth-the-trip event! Phoebe of The Lou Messougo Blog has beautiful photos and descriptions of the flowers and the grosses têtes (big heads) that make up Nice's many Carnaval parades. Phoebe offers great tips, such as: be sure to go in costume, or you'll have to pay admission for the flower parades; and: watch the parades early in the week, before floats get covered in increasing amounts of spectator-sprayed silly string. Not up for two-plus weeks of celebrating, but don't want to be limited to just this one Tuesday? 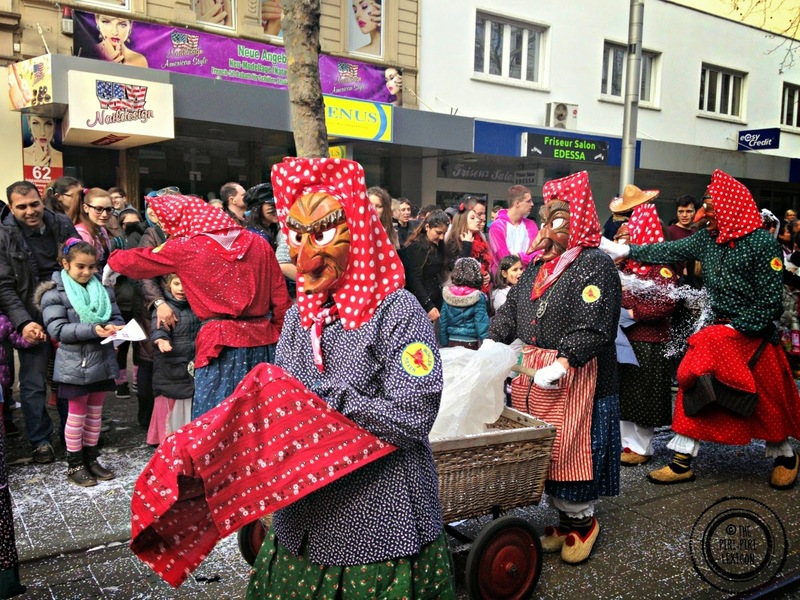 The Piri-Piri Lexicon's Annabelle says parts of Germany celebrate Fastnacht for about a week before Lent. Annabelle explains how scary pagan masks and costumes once frightened away winter and its evil spirits, but have since become characters responsible for distributing sweets and treats at the parade. 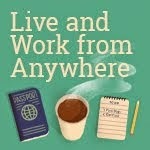 Be sure to read to the end of Annabelle's post for your fun "ah, that's so German" moment of the day! Of course, you might prefer a slightly more tame means of ushering in Lent. Why not join our friends of the British Commonwealth, and declare tomorrow to be Pancake Tuesday?! You can embrace the religious aspect of making pancakes to use up your rich ingredients before 40 days of fasting, or relive the pagan custom of consuming pancakes to tap into the power of the sun (which is round and warm, like a pancake, is apparently the reasoning). 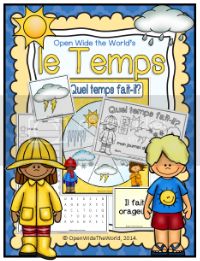 In either case, an excuse for a day of pancakes sounds yummy, and Eolia of La Cité des Vents has a great recipe for the French version, crêpes, here. After checking out the world's celebrations, perhaps you'd like to get your students or children into the N'awlins Mardi Gras spirit. 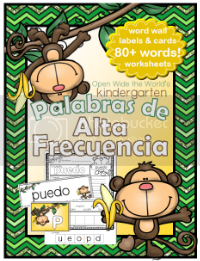 Then check out my latest facebook fan FREEBIE! 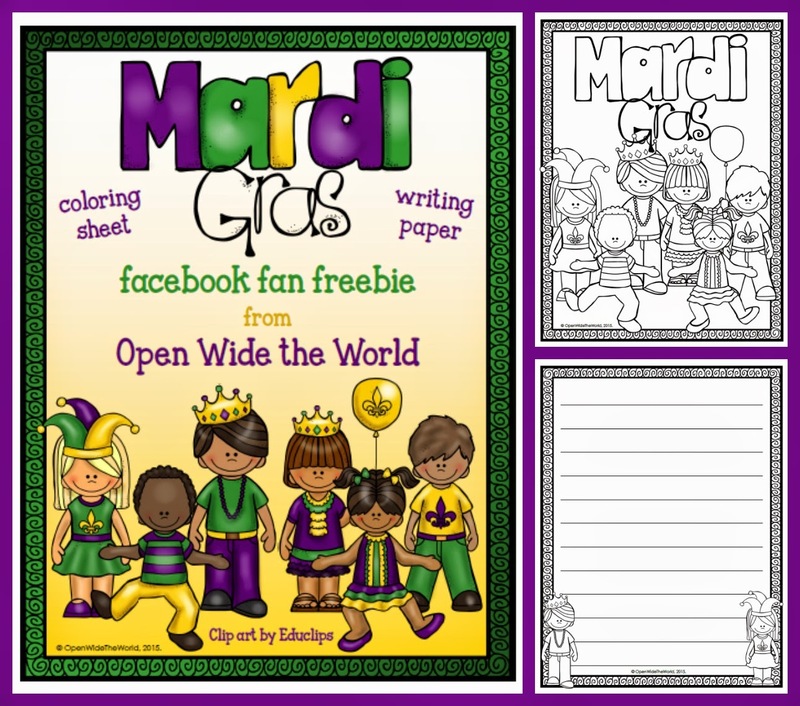 This coloring page and open-ended writing sheet, in the typical N'awlins Mardi Gras style, will work for study in any language! To access, click the image to get to my facebook page. Be sure to like the page, then look for the "Free downloads!" button in the left sidebar. Et maintenant... laissez les bons temps rouler! And however you celebrate, don't forget to thank an ancient Egyptian!